The family contacted ParaHaunt Paranormal Researchers through our website about a year ago. At that time, current members of the ParaHaunt team (Scott and Jeff) went out there and performed an investigation based on the homeowners claims of being able to feel the presence of her 'passed on' baby who died of SIDS (Sudden Infant Death Syndrome) after 40 days of life. Through ParaHaunt's researcher team, we uncovered that the baby's death certificate listed the cause of death as "Suffocation" and not SIDS. This brought up the question as to why the family was not prosecuted in some way. The answer was that they had ruled the death as accidental and that the Macomb County coroner didn't believe in SIDS as a medical condition. This never sat well with the family and felt that the baby's soul could not rest because of this. Since Scott and Jeff were the only investigators at this time who were also at the investigation a year ago, it was decided not to inform any of the other team members as to the history of the house in too much detail. We wanted to exercise and research their abilities from a 'cold case' standpoint. Note also that the walls in the pictures have changed color. This is because the walls were Aqua during our first visit and then painted white during our latest visit. As young as a soul may be, could it be possible that a 40 day old child knows enough to recognize the wrong diagnosis of a coroner’s report? Could it be that the child attempted to contact it's parents? This was another mystery ParaHaunt was ready to research. ParaHaunt Paranormal Researchers arrived at 8:00 PM and was met on the outside porch to talk about the investigation before entering the house. Only Scott and Jeff were there last year during the first attempt at investigating the phenomena. Things were quiet for approximately 8 months before the family started experiencing odd things. One example of the supposed haunting was that the mother started feeling the child's presence but then became very depressed to the point of loosing sleep and uncontrollable feelings of depression. 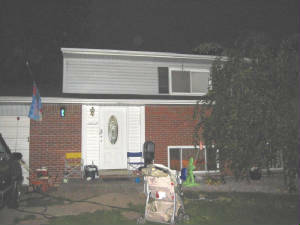 The ParaHaunt investigation team entered the home and made an initial walk through. Certain members had definite feelings surrounding two rooms in the house. Pam had a very strong 'sad' reaction to one of the upstairs bedroom. At that time, Scott and Jeff did not divulge to Pam the significance of this room. Little did Pam realize that this was the room in which the baby had passed away. Another room to which our investigators had 'feelings' about was the downstairs Mudroom, or laundry room. After about 40 minutes of performing an initial walk through, it was decided that all members of ParaHaunt would walk out to the cars and discuss what we were dealing with. At that time we also decided to bring the equipment to begin our search for activity. While not a lot was found scientifically , it was decided that we would perform a cleansing ritual. Once the ritual was performed , we talked for a bit and headed home. There has been some contact with the home owner , and they continue to experience Paranormal activity . Please stay tuned as we will be adding to this on-going investigation. This small orb to the right of the TV appears in many digital photos we took that night. Left of the picture wall is a collection of the baby's toys and momentos. Anything in the window?